The People link is in the main navigation menu only, but content or places you can start browsing by selecting Your Content or Your Places in the menu under your avatar. Start by typing a keyword in the text box and waiting for the results to refresh. Note that every browse page includes a set of filtering tabs on the left and across the top which let you refine your search criteria. For example, when you browse content, you can choose whether to browse everything or only content you authored or participated in as you can see in the following image. The icons at the top of each browse page let you filter by content type. You can limit your view by selecting certain types of information. 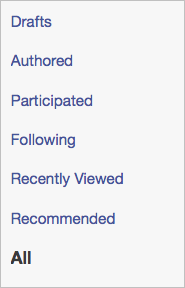 For example, you can limit content to discussions by clicking Discussions next to All Content. You can even filter by actions or outcomes marked on content. For instance, you can filter to see only content marked Official. Similarly, place browsing can be narrowed to spaces, social groups, or projects. Select Your Content from the menu under your avatar, change the filter to All, and type Sales Report in the Type to filter by text box. Then click the arrow under "Sort by latest activity" and select Sort by date created (newest or oldest). By default, the most recent results are shown first. Click People from the top navigation bar and type the Sales Director's name in the Type to filter by text box. If you don't know her name, try typing in "Sales Director." After you have located the person, click her name and go to the Content tab. From there, select Authored from the left-hand menu and Documents from the top menu to show only the documents she wrote. You can filter these further by keyword or tag if she's an especially productive content creator.